It’s a beautiful time of year here in Arizona. The temperatures are near perfect in the 80’s and the nights cool off into the 50’s and 60’s. Everything is in bloom around here, so there is actually color and not just the usual brown. Yes friends, spring is definitely my favorite time of year. Sadly though, it is short lived, typically only lasting a couple months before the dreaded heat sets in. However, while it lasts some of my favorite ways to enjoy it are gardening, hiking, bike rides, leisurely walks, and eating meals out on our patio. 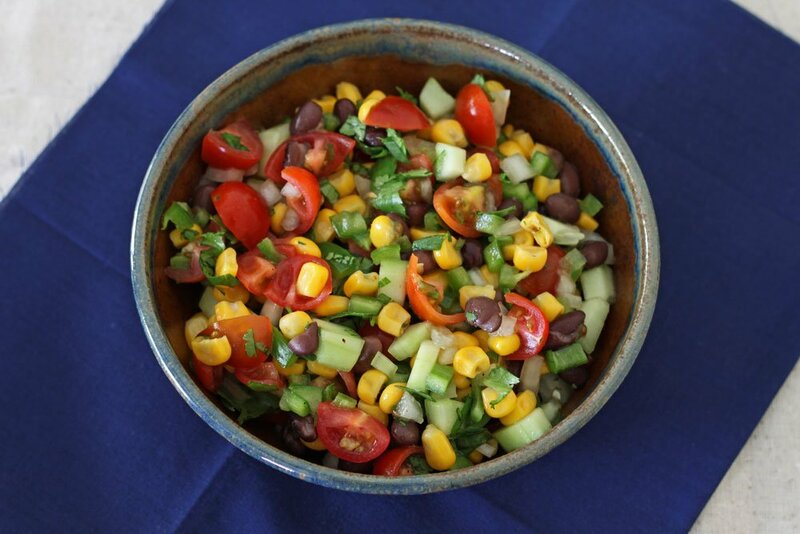 This past weekend I enjoyed making this delicious and fresh black bean and corn salad. The weather was warm so I opened all my windows and got to work chopping all the bright colored and flavorful vegetables. 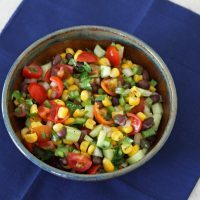 This salad uses a wonderful combination of tomatoes, onion corn, poblano chiles, a jalapeno, cilantro, and cucumbers. 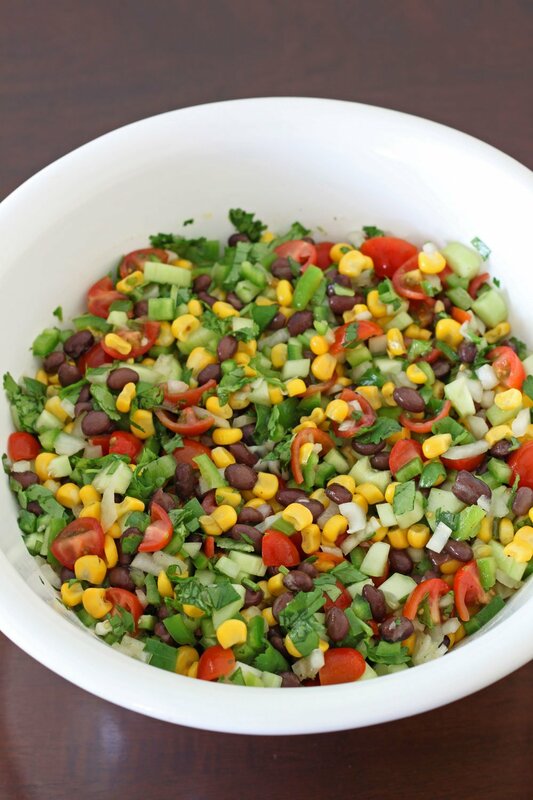 Black beans are added to the salad giving it great flavor, protein, and a beautiful contrasting color. The dressing for the salad is a simple light vinaigrette. It uses grapeseed oil, apple cider vinegar, honey, and some kosher salt. 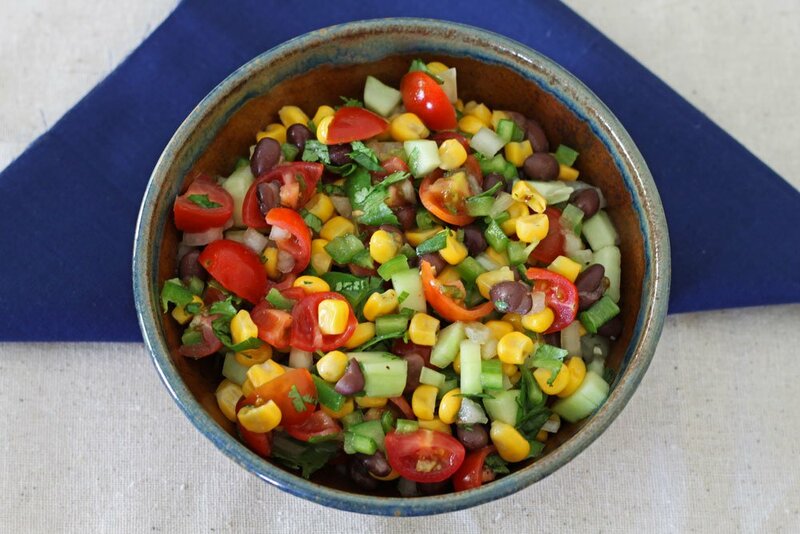 This salad would be a perfect addition to serve at your next barbecue. You could serve it as a side dish or even serve it with tortilla chips and treat it as a salsa. Because it has the black beans, it can even hold it’s own a light main dish for lunch or dinner. I hope you enjoy this salad and your wonderful springtime weather as much as I am! What is your favorite time of year and what is your favorite way to enjoy it? If using frozen corn defrost on the counter or in the microwave. Chop the tomatoes, onion, cucumbers, cilantro, chiles, and jalepeno. 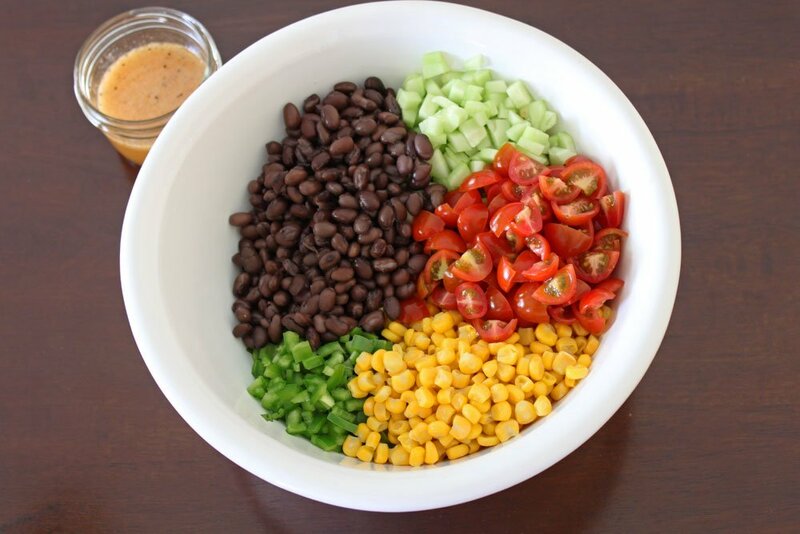 Place all of the vegetables and the beans in a large bowl and gently toss together. In a small jar with a lid combine the vinegar, oil, honey, and salt. Place the lid on the jar and shake the dressing until it is completely combined. Pour the dressing over the salad and gently fold together. Serve immediately or let the salad chill in the fridge. This salad is SO GOOD! It is fresh and tasty. You just want to put your face in the bowl and smell it for a few mintues before eating it. (That really is what it did!) I will be serving this salad to guests this weekend. Thanks again, Danae!!! Another winner!! I laughed when I pictured you sticking your face in the bowl taking in the smells! So glad you liked the salad and I'd love to hear how it goes over with your guests this weekend. I'm glad to hear the salad was a success! Definitely set a bowl aside for yourself next time. 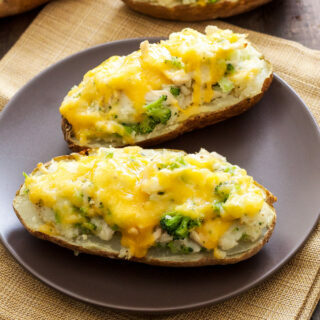 Hi, I saw you on My Family Recipe Rocks and had to come to your blog to get the recipe, looks yummy can't wait to make it!!! Thanks Shannon! Let me know what you think of it, it's definitely one of my favorite salads! I made this salad yesterday after watching your appearance on My Family Recipe Rocks. It was/is delicious. So glad I saw the show!!! Awesome! I'm so glad you enjoyed it, always good to get positive feedback on my recipes! 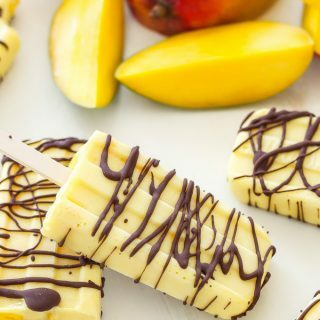 Looks yummy and can't wait to try. Can you use olive oil in place of the grapeseed oil? I have family members that can't have spice, what is the spice level? Thanks! Thanks Jill! I would recommend using vegetable or canola oil instead of olive oil, you want a flavorless oil. The spice level is very low as long as you remove the seeds from the jalepeno. Hope you and your family enjoy it! Hi - I also saw you on My Family Recipe Rocks. 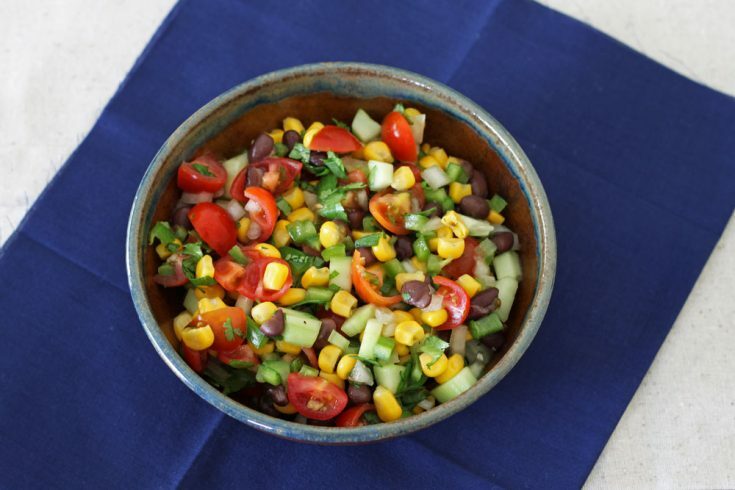 This black bean and corn salad that you prepared on the show looked so refreshing and delicious. I'm pleased you have a blog with other recipes and a newsletter. So looking forward to making the salad this week. Thanks! Thanks Jojo! 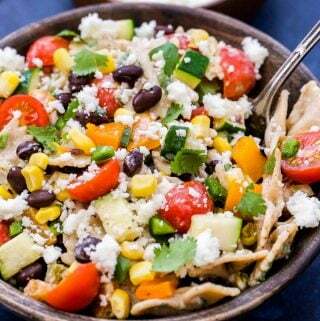 I hope you enjoy the salad, it's one of my favorites and so perfect for summer!